Mark was a sister's son to Barnabas, #Col 4:10|; and #Ac 12:12| shows that he was the son of Mary, a pious woman of Jerusalem, at whose house the apostles and first Christians assembled. From Peter's styling him his son, #1Pe 5:13|, the evangelist is supposed to have been converted by that apostle. Thus Mark was closely united with the followers of our Lord, if not himself one of the number. Mark wrote at Rome; some suppose that Peter dictated to him, though the general testimony is, that the apostle having preached at Rome, Mark, who was the apostle's companion, and had a clear understanding of what Peter delivered, was desired to commit the particulars to writing. And we may remark, that the great humility of Peter is very plain where any thing is said about himself. Scarcely an action or a work of Christ is mentioned, at which this apostle was not present, and the minuteness shows that the facts were related by an eye-witness. This Gospel records more of the miracles than of the discourses of our Lord, and though in many things it relates the same things as the Gospel according to St. Matthew, we may reap advantages from reviewing the same events, placed by each of the evangelists in that point of view which most affected his own mind.The office of John the Baptist. (1-8) The baptism and temptation of Christ. (9-13) Christ preaches and calls disciples. (14-22) He casts out an unclean spirit. (23-28) He heals many diseased. (29-39) He heals a leper. (40-45)1-8. Isaiah and Malachi each spake concerning the beginning of the gospel of Jesus Christ, in the ministry of John. From these prophets we may observe, that Christ, in his gospel, comes among us, bringing with him a treasure of grace, and a sceptre of government. Such is the corruption of the world, that there is great opposition to his progress. When God sent his Son into the world, he took care, and when he sends him into the heart, he takes care, to prepare his way before him. John thinks himself unworthy of the meanest office about Christ. The most eminent saints have always been the most humble. They feel their need of Christ's atoning blood and sanctifying Spirit, more than others. The great promise Christ makes in his gospel to those who have repented, and have had their sins forgiven them, is, they shall be baptized with the Holy Ghost; shall be purified by his graces, and refreshed by his comforts. We use the ordinances, word, and sacraments without profit and comfort, for the most part, because we have not of that Divine light within us; and we have it not because we ask it not; for we have his word that cannot fail, that our heavenly Father will give this light, his Holy Spirit, to those that ask it. 9-13 Christ's baptism was his first public appearance, after he had long lived unknown. How much hidden worth is there, which in this world is not known! But sooner or later it shall be known, as Christ was. He took upon himself the likeness of sinful flesh; and thus, for our sakes, he sanctified himself, that we also might be sanctified, and be baptized with him, #Joh 17:19|. See how honourably God owned him, when he submitted to John's baptism. He saw the Spirit descending upon him like a dove. We may see heaven opened to us, when we perceive the Spirit descending and working upon us. God's good work in us, is sure evidence of his good will towards us, and preparations for us. As to Christ's temptation, Mark notices his being in the wilderness and that he was with the wild beasts. It was an instance of his Father's care of him, which encouraged him the more that his Father would provide for him. Special protections are earnests of seasonable supplies. The serpent tempted the first Adam in the garden, the Second Adam in the wilderness; with different success indeed; and ever since he still tempts the children of both, in all places and conditions. Company and conversation have their temptations; and being alone, even in a wilderness, has its own also. No place or state exempts, no business, not lawful labouring, eating, or drinking, not even fasting and praying; often in these duties there are the most assaults, but in them is the sweetest victory. The ministration of the good angels is matter of great comfort in reference to the malignant designs of the evil angels; but much more does it comfort us, to have the indwelling of God the Holy Spirit in our hearts. 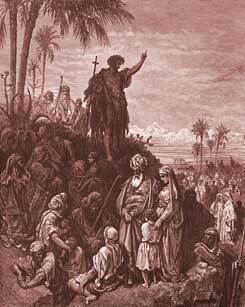 14-22 Jesus began to preach in Galilee, after that John was put in prison. If some be laid aside, others shall be raised up, to carry on the same work. Observe the great truths Christ preached. By repentance we give glory to our Creator whom we have offended; by faith we give glory to our Redeemer who came to save us from our sins. Christ has joined these two together, and let no man think to put them asunder. Christ puts honour upon those who, though mean in this world, are diligent in their business and kind to one another. Industry and unity are good and pleasant, and the Lord Jesus commands a blessing on them. Those whom Christ calls, must leave all to follow him; and by his grace he makes them willing to do so. Not that we must needs go out of the world, but we must sit loose to the world; forsake every thing that is against our duty to Christ, and that cannot be kept without hurt to our souls. Jesus strictly kept the sabbath day, by applying himself unto, and abounding in the sabbath work, in order to which the sabbath rest was appointed. There is much in the doctrine of Christ that is astonishing; and the more we hear it, the more cause we see to admire it. 23-28 The devil is an unclean spirit, because he has lost all the purity of his nature, because he acts in direct opposition to the Holy Spirit of God, and by his suggestions defiles the spirits of men. There are many in our assemblies who quietly attend under merely formal teachers; but if the Lord come with faithful ministers and holy doctrine, and by his convincing Spirit, they are ready to say, like this man, What have we to do with thee, Jesus of Nazareth! No disorder could enable a man to know Jesus to be the Holy One of God. He desires to have nothing to do with Jesus, for he despairs of being saved by him, and dreads being destroyed by him. See whose language those speak, that say to the Almighty, Depart from us. This unclean spirit hated and dreaded Christ, because he knew him to be a Holy One; for the carnal mind is enmity against God, especially against his holiness. When Christ by his grace delivers souls out of the hands of Satan, it is not without tumult in the soul; for that spiteful enemy will disquiet those whom he cannot destroy. This put all who saw it upon considering, What is this new doctrine? A work as great often is wrought now, yet men treat it with contempt and neglect. If this were not so, the conversion of a notorious wicked man to a sober, righteous, and godly life, by the preaching of a crucified Saviour, would cause many to ask, What doctrine is this? 29-39 Wherever Christ comes, he comes to do good. He cures, that we may minister to him, and to others who are his, and for his sake. Those kept from public ordinances by sickness or other real hinderances, may expect the Saviour's gracious presence; he will soothe their sorrows, and abate their pains. Observe how numerous the patients were. When others speed well with Christ, it should quicken us in seeking after him. Christ departed into a solitary place. Though he was in no danger of distraction, or of temptation to vain-glory, yet he retired. Those who have the most business in public, and of the best kind, must yet sometimes be alone with God. 40-45 We have here Christ's cleansing of a leper. It teaches us to apply to the Saviour with great humility, and with full submission to his will, saying, "Lord, if thou wilt," without any doubt of Christ's readiness to help the distressed. See also what to expect from Christ; that according to our faith it shall be to us. The poor leper said, If thou wilt. Christ readily wills favours to those who readily refer themselves to his will. Christ would have nothing done that looked like seeking praise of the people. But no reasons now exist why we should hesitate to spread the praises of Christ. Mark an eyewitness of the word is true accounts of Christ Jesus,should be characterized.Christ Jesus,my redeemer and savour all that received Him. Verse 38~Jesus delighted in curing others and helping them physically, but his primary focus was on preaching about God's Kingdom. While charity and giving to others financially has its place, in imitation of Jesus our main focus should be on preaching the good news of God's Kingdom. Verse 35~Jesus had already had a busy day, but this verse shows that he got up early to pray. Though people made many demands of Jesus' time and energy, he never neglected his own spirituality. Jesus is my everything. Lord I thank you for your word, Your word is true mark followed God word and believed. verse 20...leaving their father and the 'hired servants'...same Greek word "misthotos" used (only other time in NT), to define paid preachers...John 10:12,13. "But he that is an hireling, and not the shepherd, whose own the sheep are not, seeth the wolf coming, AND LEAVETH THE SHEEP". "the hireling fleeth BECAUSE HE IS AN HIRELING. So much for a paid pastorate...In Jesus' opinion at any rate. Olu: Jesus (oh I love that name Jesus) is God but he lived his life as a man on earth. He has all the attributes of a man on earth. He became a man in other to qualify to save man. He came to teach us how to activate God's word to get result. Verse 12 shows that He prepared well before starting the soul winning job. Imagine, He just say "follow me" and its done. The job is easier when prepared. Olu william; Jesus was born in Bethlehem of Judea of His mother Mary...Jesus Christ came in the flesh to save us all from our sins and the power of darkness, reconciling us to God BY HIS BLOOD! The Apostles were chosen from among MANY witnesses to testify the Glad Tidings of the grace of God THROUGH JESUS DYING ON THE CROSS FOR US! JESUS IS A PERSON! What Do You Think of Mark 1? Who was Jesus baptized by?